A friend and I were talking about cars. His car recently died on him. It needs a new transmission but that would cost more than the car is worth. The car lasted him around 14 years and he got maybe 130,000 miles out of it. My previous car had a fairly similar track record with about 12 years and about 130,000 miles before it needed a major repair. I think getting 130,000 miles out of a car isn't so bad. Its not great and I hope that todays cars will be good for 150,000 miles, but mid 90's cars lasting 130,000 miles wasn't so bad. 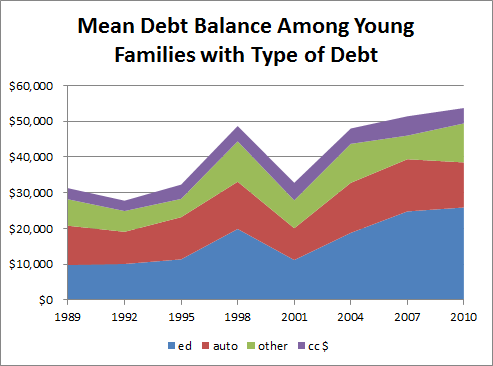 In the same topic JD Power recently released their latest 2013 survey results. I saw someone say that their results are 'useless' because they only go back 3 years. OK that kinda makes sense, as a better measure of how reliable a car is would be what % of cars can make it 150,000 or 200,000 miles. The 3 year JD Power study isn't long enough to tell you that. I think it is still nice to know which cars have more problems within the first 3 years since thats pretty meaningful. A very well made car will have low failure rate in the first three years and a poorly built car is more likely to fail within three years. Still it would be useful to know how often a particular car might last for 200,000 miles without being a total loss. I then went hunting for information on the % of cars that last over 10 years. I found one article on that kind of topic. I got it from a CBC news article written in 2007 so its a bit old and from Canada. I figure Canadian data is probably just about the same as American. I know its a little different since Canadian auto market is a little different than the US but I'm thinking that most of the cars sold in North America are basically the same exact cars with different numbers on the speedometer. Now this information is from 2007 and its talking about cars on the road 11-15 years later. That means we're dealing with the reliability of cars bought 11-15 years before 2007 or back in 1992 to 1996. Thats now 17-21 years ago. A lot can change in a market in 17-21 years. SO unless you're in the market for a mid 1990's car then this information isn't really too practical. For example, look at how Hyundai is WAY down on the bottom of that list. Today Hyundai has made great strides in reliability and today they are above average in the 2013 JD Power Initial Quality Survey. What I think is better is to watch the longer term trends. You'll notice that Porsche is at the top of the list below and Porsche also happens to be #1 in the latest 2013 JD Power IQS. Toyota and Cadillac are both well above average in both lists. Dodge and Subaru are both below average. p.s. I don't know what a Lada is either but I'm glad I didn't go to Canada and buy one. FreeMoneyFinance has created a new blog called Wealth Lion. Servers as a good reminder to research charities in advance and make sure a large % of their money actually goes to those who need it. 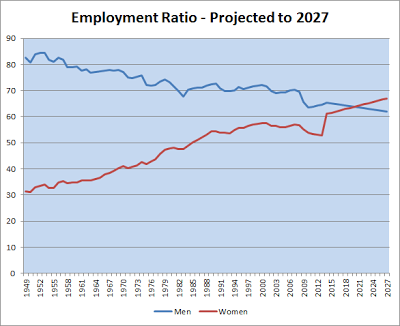 I've been talking about the labor force lately and changes in the labor force participation for men and women. The labor force participation dropped a couple percent in the past few years. 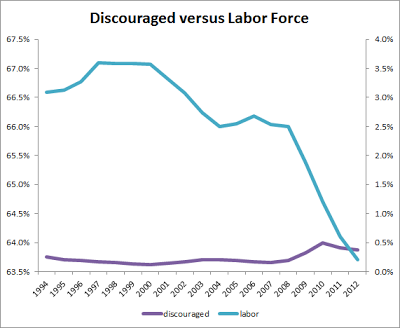 Where did the labor force go? I've been examining a few theories to see where some of the people might have gone. 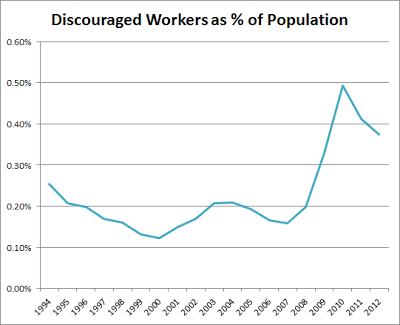 Recently I looked at how the military population might impact the labor force figures. Active military personnel are not included in the government labor force data. 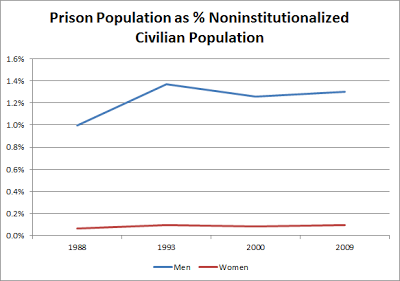 The BLS only looks at the 'civilian noninstitutionalized population'. Another group that the government doesn't consider is the people in prison. So changes in the prison population might impact the labor force data. Are we putting more people in prison? 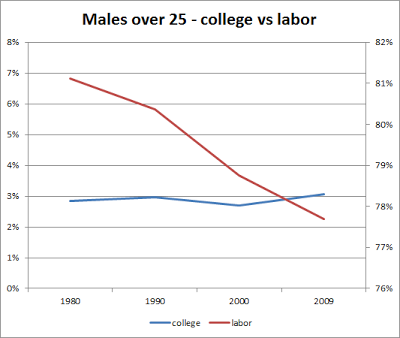 Could that decrease the labor force? What if we threw another couple million people in prison and jails in the past 5 years, that would surely move the labor force statistics. I got data on the prison and jail population from the Bureau of Justice Statistics. I got recent data for prisoners as of 2009 and persons incarcerated for 1993 and 1988. I added up the numbers for prison and jail inmates for both state and federal. As you might have guessed the prison and jail population is dominated by men. To see how this compares to the labor force data I got the labor 'civilian noninstitutionalized population' figures from the BLS. I used the data for 16 years and older. I don't know the age range data for the prison population, but I'm sure its close enough. There hasn't been much change. The % of the male population jumped a bit between '88 and '93 but has not varied more than 0.1% since. The population of women inmates is virtually flat. 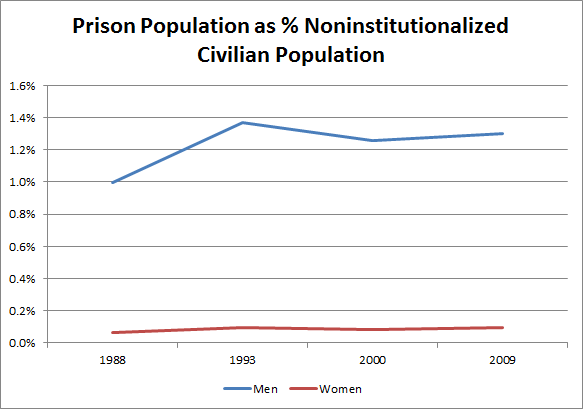 From 2000 to 2009 the % of inmates for men rose just 0.04% and women was up 0.01%. Those are pretty marginal differences. My conclusion is that changes in the inmate population have not been large enough lately to have much of a noticeable impact on the labor force statistics. Included are persons 16 years of age and older residing in the 50 States and the District of Columbia who are not inmates of institutions (for example, penal and mental facilities, homes for the aged), and who are not on active duty in the Armed Forces." The unemployment rate and labor force participation rate are then figured as % of the civilian noninstitutional population. Therefore the military isn't part of the picture at all. 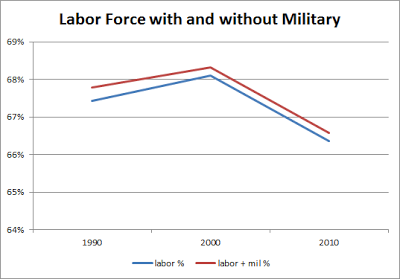 I'd have to wonder how changes in the size of the military would impact the labor force participation rate. We've had a couple wars going on so I would think we'd have a larger military lately. Would an increased military reduce the labor force? I would think so. That might then actually reduce the labor force participation rate. In a hypothetical situation a large change in the military force might have big impacts on the labor force participation and unemployment rates. Lets say we have a fictional island country with just 20 residents. 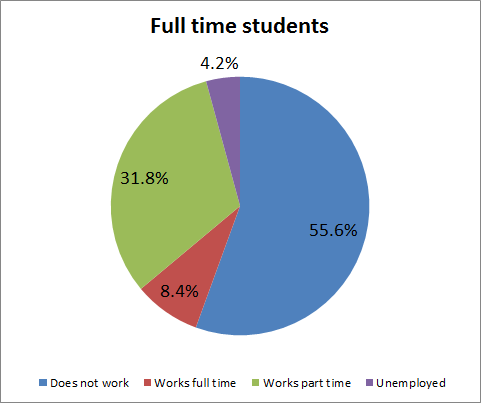 Of the 20 people we have : 15 people working jobs, 3 people who do not work for varying reasons and 2 people are unemployed. Thats a labor force participation rate of 75% and an unemployment rate of 10%. Now lets say that the island goes to war with the neighboring island over a dispute over fishing rights and 5 men are drafted. Well now theres only 15 people in the 'civilian noninstitutional population'. 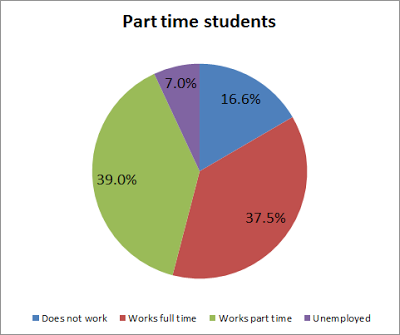 The 2 unemployed people get jobs and the 3 people who don't work still don't work and the other 10 stay in their jobs. That means we'd have 0% unemployment and 80% labor force participation. Of course thats just hypothetical to illustrate how military numbers might change things. We could see this going on during WWII to some extent I'm sure. OK but what if we didn't exclude the military personnel from our labor force figures? 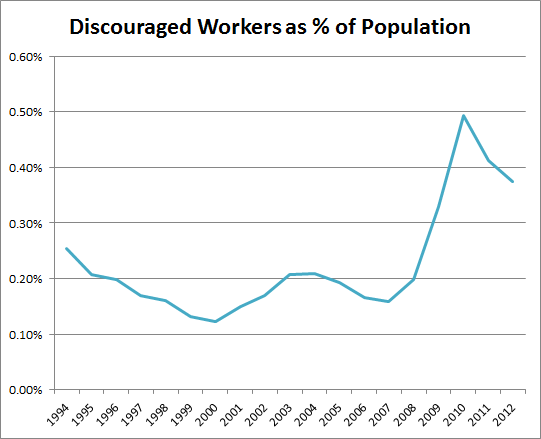 In my example above it would be a large swing between 80% labor force participation and 85% participation. Enough talk... lets look at the numbers. First I get the number of military personnel from the Census. And then we'll need to look at BLS labor figures. I had to do a little math and take the labor figures for the population over 16 years old and then subtract the 16-17 group to get figures for the 18 and older group. First of all I quickly realize that I was wrong about my assumption about the size of the military increasing. In fact our military hasn't grown all that much in the past 10 years. We had a significantly larger military back in 1990. In 1990 we had 2.0 million personnel, 2000 it was 1.38M and 2010 it was 1.43M. The percent of the population in the military has actually shrunk. This could shift the labor force. 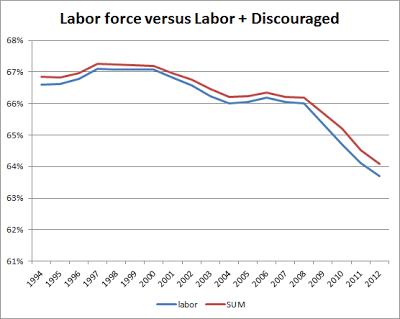 Lets look at the labor force participation with and without the military included. Normally the BLS does not include the military. But what if the figures did include the military? In the last couple decades the impact of the military would have only had 0.2% to 0.3% change in the labor force. Thats not a big difference and it hasn't varied too much. 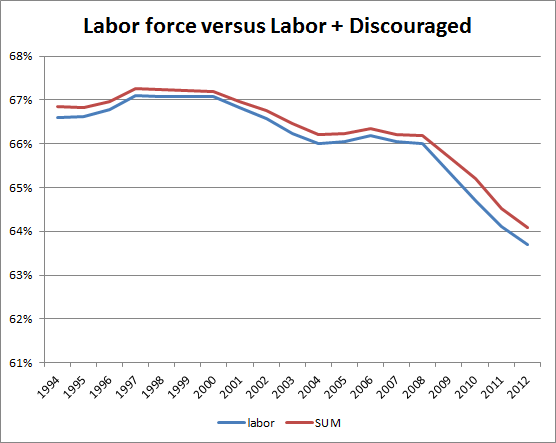 From 1990 to 2010 the labor force participation rate is down 1.1%. If we had included the military then the rate would be down 1.2%. Now lets look at how the unemployment rate would differ if we included the military in the labor pool. If we included the military personnel in our labor force then unemployment would differ just 0.09%. Thats almost a 1/10th of a percent so its not insignificant but its certainly not a big difference. The fact of the matter is that the total military personnel is not a huge portion of our population and it hasn't varied all that much. It hasn't had a significant impact on the labor force rate or the unemployment rate. 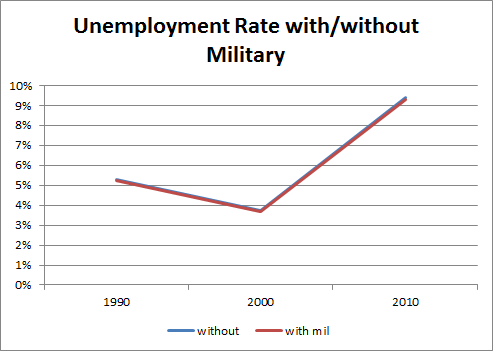 Of course if the military grew drastically then it would have a larger impact. 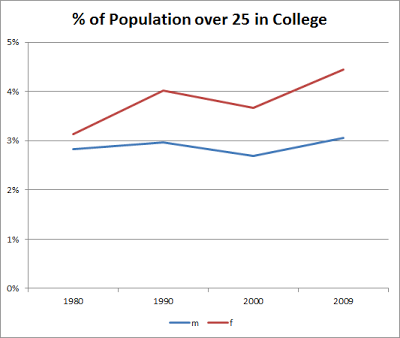 Last time on the topic, I took a look at the impact of higher college enrollment rates for people age 18-24 versus the labor force participation rate. It seemed to me that higher college enrollment had a pretty direct and obvious impact on labor force participation. But what about people over 25 years old? 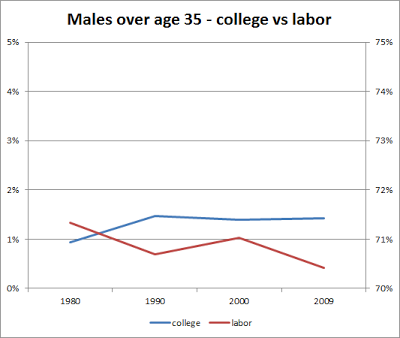 Are there also more older people going to college and is that impacting the labor force too? 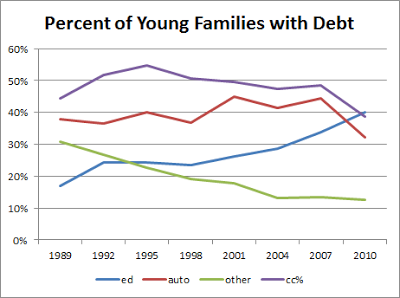 Again I got the data from the census and the BLS. 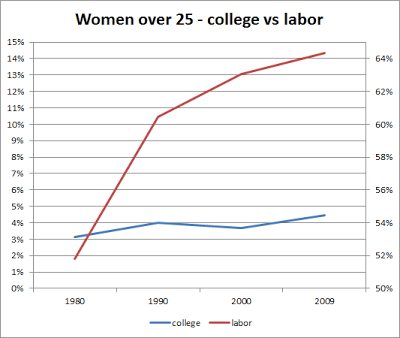 I decided to lump all ages over 25 years together. The Census data has data for ages 25 to 34 and for 35 and over. 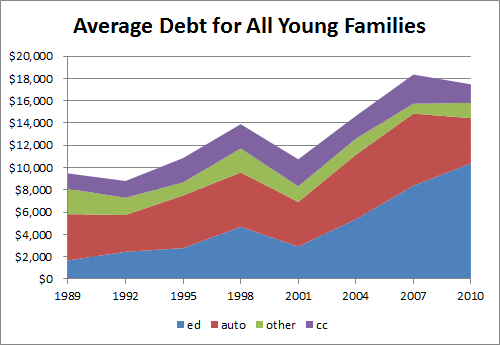 As you can see there is a small increase over the past 30 years. The change for women is more visible. In 1980 there was 3.1% of the women population over age 25 in college and by 2009 it had grown to 4.4%. For men the differences are petty minimal and enrollments have fluctuated a little ranging from 2.7% to 3.1%. 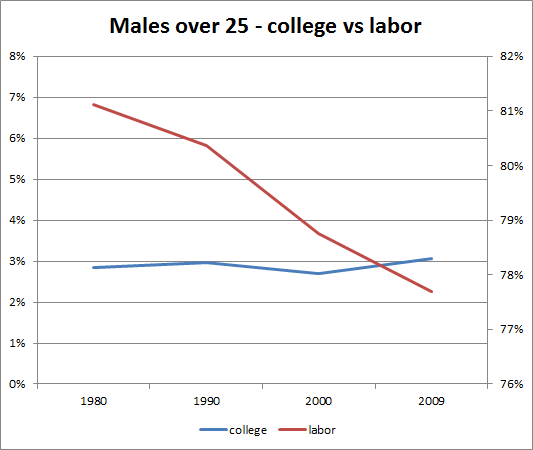 For men the college enrollment is almost flat so its hard to see that there would be any impact to the labor force. For women both rates are up over the decades. Looking at those two charts above I don't see a significant relationship between the % college attendance and the labor force participation rate. 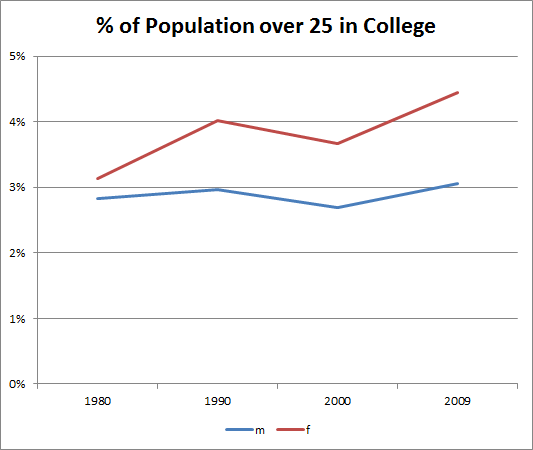 However the total population over age 25 has a lot of people even including those over age 65. Its a pretty broad group. 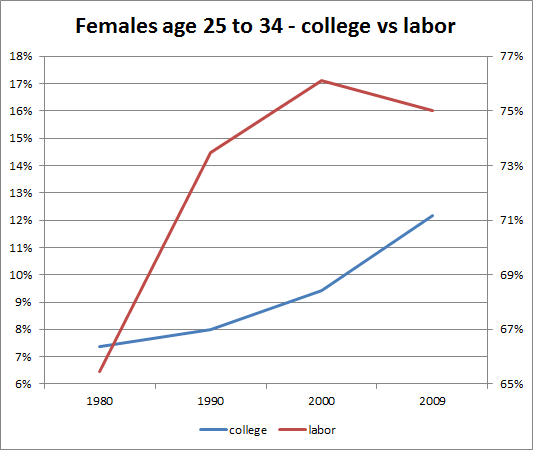 Lets look a little closer at the group age 25 to 34. That age range is a lot more likely to be in college in general either in graduate or professional programs, returning to school or first starting college at a later age. Just looking at those graphics and focusing on the change from year 2000 to 2009 it does seem to me that there was a notable increase in college enrollment. Men were up 2% and women up almost 3%. These are more notable increases. 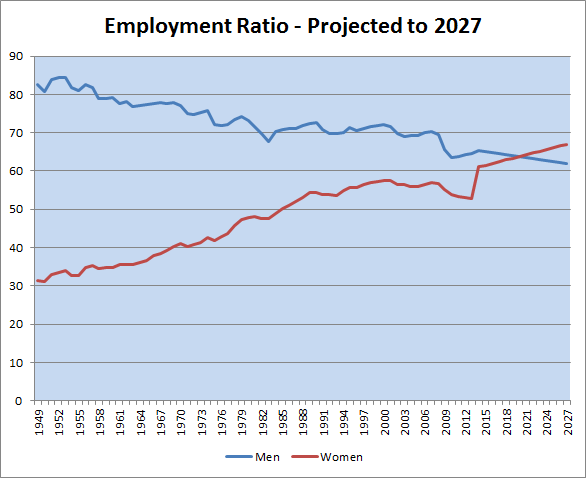 At the same time mens labor force was down 3% and womens down 1%. 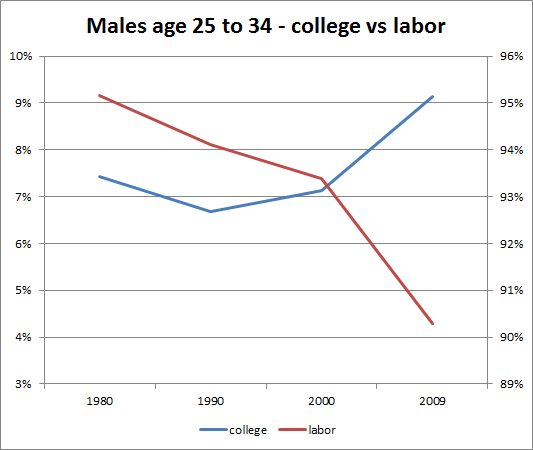 For the age group of 25 to 34 year olds we could assume then that increased college attendance was a significant reason for reduced labor force participation. 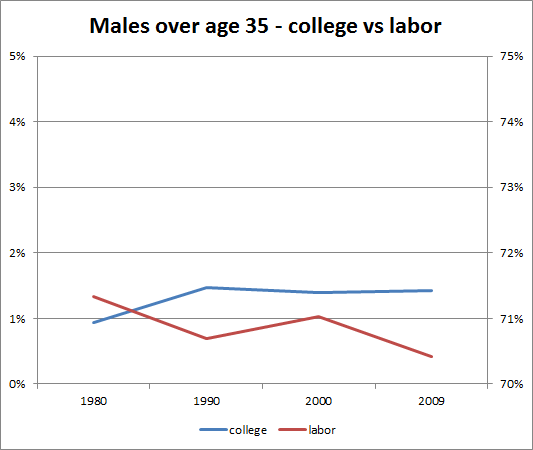 Lastly lets look at the age group over 35 years old. Much smaller % of that group goes to college. Here I see little differences in the college attendance % rates. 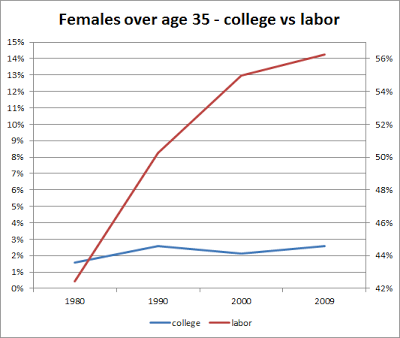 The % of the population over age 35 in college has been almost flat for the past 30 years for both men and women.